1 . USA. 2.Canada. 3.United Kingdom. 2. Hi-Spec Engineering Ltd, Ireland. 3. LK Verkstad AB, Sweden. Address: Hi-Spec Engineering Ltd., Station Road, Bagenalstown, Co Carlow, Ireland. Hi-Spec Engineering Ltd. was established in 1988 and is located in Bagenalstown, Co. Carlow, Ireland. Since then it has grown steadily and built up a solid reputation as a manufacturer of high quality farm machinery. The company currently employs 45 full-time staff. The company manufactures machinery for the agricultural sector, concentrating mainly on vertical feeders, diet feeders, vacuum tankers & slurry pumps. During the past couple of years the company has changed its focus somewhat and has been manufacturing fuel bowsers and dust suppressor units for the building and industrial sector. 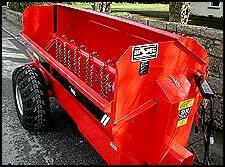 Customers for these are mainly utility companies in the waste management industry. The main markets for the companies products are Ireland, UK, Denmark, Germany, France, USA, Iceland and Russia. The company has a manufacturing and storage capacity of approximately 6,000 square metres, in the town of Bagenalstown, Co Carlow. It has an on going programme of modernising and up-dating its production facilities and during the past few years it has installed a CNC plasma cutter, CNC pressbrake, CNC punch and saws along with numerous other improvements. Research and Development in Hi-Spec Engineering is on-going. The company has earned a universal reputation for the high quality and reliability of their products. This is primarily the result of the hands-on approach of Hi-Spec management and the years of experience and skill of the work force. Hi-Spec products are up-dated on a continuous basis so as to incorporate the latest technology and innovations into the products. Production methods are also continuously assessed for new ways of doing things to increase efficiency and maintain and improve the quality of the final product. The Hi-Spec Super 400 Slurry Pump is one of the highest performing pumps on the market today, with a power requirement of only 75h.p it creates an one of the highest outputs available. Depending on the slurry density this can vary from 3,000 gallons (13,600ltrs) to 4,000 gallons (18,200 ltrs) per min, easily making the Hi-Spec Super 400 Slurry Pump a market leader. Each Super 400 Slurry Pump comes complete with a unique quick attachment pick-up system, making it an extremely fast and easy task to both link and unlink the pump to and from the tractor. As changing from the transport to working position requires no disconnection of the P.T.O shaft, it is possible to travel from slurry tank to slurry tank without ever having the hassle of disconnecting the P.T.O. 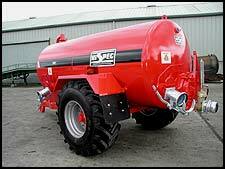 The Super 400 Slurry pump is suitable for use in both open type ground level tanks and slatted house tanks.